The Waste Master Sewer Hose System is the best sewer hose on the market. It is the strongest. It’s UV protected. It’s easy to use, and most importantly, eliminates leakage due to its Fitting Connection Technology. This technology uses industrial strength Cam Loc fittings and an engineered nozzle with a shut off. But what if we could make dumping your tanks even easier? We did! If your RV allows for a permanent connection to your RV, you can now have a completely closed system. How do I Know if the Waste Master Sewer Hose Storage System will Fit? Not all RVs can have the hose permanently connected, but most 5th wheels and travel trailers do have that capability. Many Class A and C RVs have space to store the system as well. Every day we get calls from RVers asking this question, so we have them send us pictures and help them determine if our system will fit. Click Here to see our 5th Wheel & Travel Trailer permanent connection options, then give us a call for a free, no pressure waste system evaluation. When it comes to Class A motorhomes, we do it a bit differently. 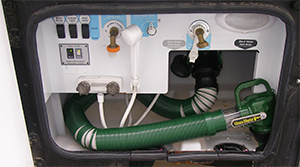 Because the sewer outlet is in a waste bay, most Class A and C RVs have an area large enough to store our system in a permanent connection configuration. Click Here to see if your motorhome has enough space to consider installing the Waste Master system. 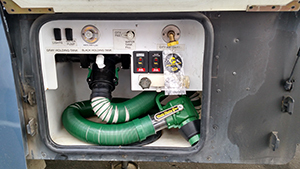 Even if there isn’t a way to permanently connect Waste Master to your RV, upgrading to this hose will still drastically improve the way you feel about dumping your tanks. It’s packed with all of the most important features a sewer hose should have. All-in-one system with no fittings to deal with and store. Sta-Put Feature– Allows the hose to behave like a bendable drinking straw so it stays extended during use to exact length and orientation required. Durability– Strongest hose on the market. The Helical coil on the outside of the hose acts as a wear barrier. It’s UV protected and features the best compression ratio of any sewer hose, 4 to 1. Nozzle– keeps contaminants and odors locked inside. Features handle, shut off valve, clear view port, and a rubber donut seal that fits over 90% of sewer inlets across the country. Cam Loc Connection– installs over your RV’s bayonet fitting and provides a strong reliable seal eliminating leaks forever. Click for Free Waste Master System Evaluation!